By slowing and absorbing certain wavelengths of light, engineers open new possibilities in solar power, thermal energy recycling and stealth technology. More efficient photovoltaic cells. Improved radar and stealth technology. A new way to recycle waste heat generated by machines into energy. All may be possible due to breakthrough photonics research at the University at Buffalo. The work, published March 28 in the journal Scientific Reports, explores the use of a nanoscale microchip component called a "multilayered waveguide taper array" that improves the chip's ability to trap and absorb light. Unlike current chips, the waveguide tapers (the thimble-shaped structures above) slow and ultimately absorb each frequency of light at different places vertically to catch a "rainbow" of wavelengths, or broadband light. The paper, "Broadband absorption engineering of hyperbolic metafilm patterns," is here. "We previously predicted the multilayered waveguide tapers would more efficiently absorb light, and now we've proved it with these experiments," said lead researcher Qiaoqiang Gan, PhD, UB assistant professor of electrical engineering. "This advancement could prove invaluable for thin-film solar technology, as well as recycling waste thermal energy that is a byproduct of industry and everyday electronic devices such as smartphones and laptops." Each multilayered waveguide taper is made of ultrathin layers of metal, semiconductors and/or insulators. 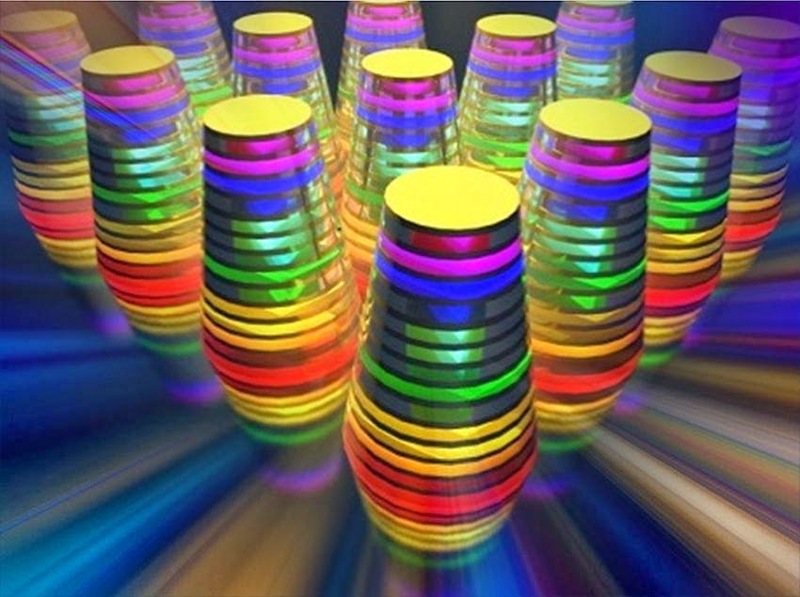 The tapers absorb light in metal dielectric layer pairs, the so-called hyperbolic metamaterial. By adjusting the thickness of the layers and other geometric parameters, the tapers can be tuned to different frequencies including visible, near-infrared, mid-infrared, terahertz and microwaves. The structure could lead to advancements in an array of fields. For example, there is a relatively new field of advanced computing research called on-chip optical communication. In this field, there is a phenomenon known as crosstalk, in which an optical signal transmitted on one waveguide channel creates an undesired scattering or coupling effect on another waveguide channel. The multilayered waveguide taper structure array could potentially prevent this. It could also improve thin-film photovoltaic cells, which are a promising because they are less expensive and more flexible that traditional solar cells. The drawback, however, is that they don't absorb as much light as traditional cells. Because the multilayered waveguide taper structure array can efficiently absorb the visible spectrum, as well as the infrared spectrum, it could potentially boost the amount of energy that thin-film solar cells generate. The multilayered waveguide taper array could help recycle waste heat generated by power plants and other industrial processes, as well as electronic devices such as televisions, smartphones and laptop computers. "It could be useful as an ultra compact thermal-absorption, collection and liberation device in the mid-infrared spectrum," said Dengxin Ji, a PhD student in Gan's lab and first author of the paper. It could even be used as a stealth, or cloaking, material for airplanes, ships and other vehicles to avoid radar, sonar, infrared and other forms of detection. "The multilayered waveguide tapers can be scaled up to tune the absorption band to a lower frequency domain and absorb microwaves efficiently," said Haomin Song, another PhD student in Gan's lab and the paper's second author.